Located along the Red Lake River in Northwest Minnesota. Communities include: Crookston, East Grand Forks, Fertile, Fosston, Red Lake Falls, St. Hilaire and Thief River Falls. There are multiple opportunities to explore in Riverland, including: fishing, snowmobiling, hiking, biking, hunting, bird watching, camping, canoeing, tubing, shopping, dining, golfing, swimming, festivals & events, boating, skiing and historic landmarks. Explore Riverland website can be viewed here. Named for the beautiful Northern Lights that often dance across the sky. Features the Waters of the Dancing Sky Scenic Byway, which stretches 191 miles across the far north/northwest portion of Minnesota. Waters of the Dancing Sky website can be viewed here. Highway 75 was dubbed the King of Trails ninety years ago. 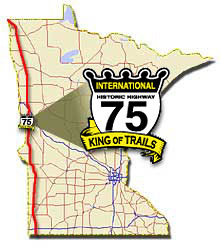 The Minnesota portion, King of Trails Scenic Byway, stretches 414 miles along the western border. Many interesting travel and touring destinations including museums, natural areas, historic sites, festivals, outdoor events and much more. Annual events include the Highway 75 Marketplace. Held in September, participating cities invite vendors to market their goods, creating a route of fun and entertainment. A travel guide is available that describes points of interest along the route. Please visit the website for instructions on how to request your copy! The Norman County Tourism group aims to promote recreational activities that occur within Norman County. Information about dining, lodging, parks, golf courses, bowling, trails, museums and much more can be found on the Norman County website. The Red Lake River Corridor web site has information about trip planning, activities, maps and much more. The Red Lake River is one of a few state canoe routes in Northwest Minnesota. It flows west from the Upper/Lower Red Lake to the Red River in East Grand Forks. Northwest Minnesota is at the junction of three biomes, providing ample opportunities to watch wildlife. This group has a wonderful web site at www.mnbirdtrail.com that contains birding information, maps, and contact information. A birding guide is available that lists all sites and emphasizes: features, best visiting times, native birds, contacts and other related notes. Please see the website for more information. This route tracks from Greenbush to Baudette across the north part of Minnesota along Highway 11. 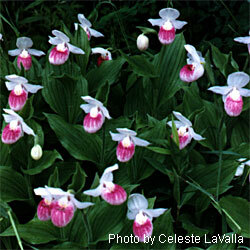 Minnesota’s protected state flower, the Lady Slipper, is featured. (photo example to the right). These plants require very unique soil conditions and seven years of maturation before blooming. They are very hard to establish and transplant. The DNR estimates that there are also more than two million orchids along this route, that bloom from the the beginning of May through September. An annual festival occurs in Williams. 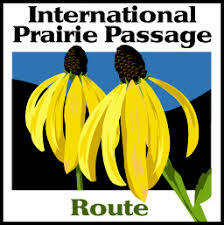 The Prairie Passage represents an international effort to identify/preserve native prairie. Restoration, protection and education are all practiced. Five other states, as well as Canada and Mexico are involved in the route. In Minnesota, the 600-mile Prairie Passage route meanders down the western side of the state, from Hallock to Luverne, and along I-90 in the far south between Luverne and Albert Lea. The MOM’s Way Tourism Association’s mission is to nurture and promote tourism along highways 11 and 12 spanning across Manitoba, Minnesota and Ontario. The Association operates as an independent, nonprofit organization representing a membership that is comprised of businesses and communities working together to make your visit enjoyable, relaxing and memorable. Members include tourism related businesses, municipalities, regional districts and chambers of commerce.